I'm interested in Indian food, especially food from historic times, like the Mughal's. 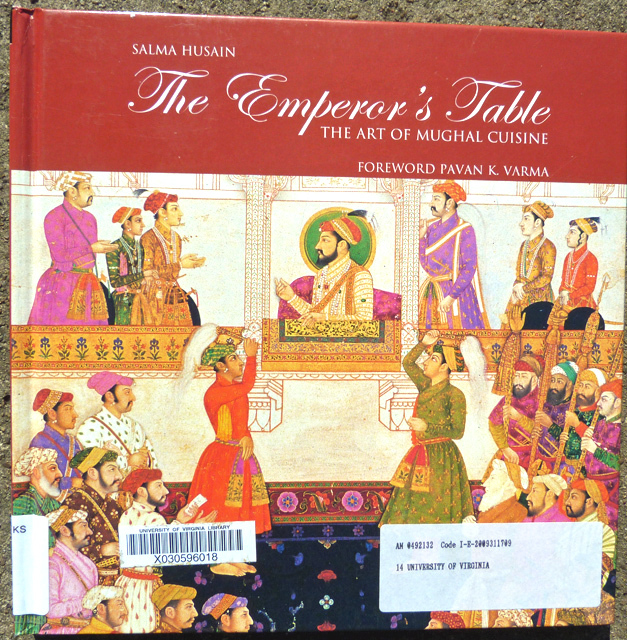 So, I'm going to experiment and cook some of the recipes from Salma Husain's The Emperor's Table (2008. ISBN: 8174364536). We start with two recipes from the time of Emperor Babur (1494-1530), Karam Dulma or Stuffed Cabbage Rolls and Kyulcha or Spicy Wholewheat Baked Bread. I cooked these last night, Saturday the 5th of Februray 2011. I write a narrative of the details of making these below. I'm not sure if Salma Husain personally tried all the recipes in the book, or watched others make them (like he did with the Uzbekistan wedding pulao) but I think there might need some more modifications to what Salma has hinted at in his Author's Note. Of course, that's generally true with cooking anything - follow the recipe exactly, and some how there's something missing, or some sort of adjustments need to be made to improve it or even make it right. The way I cook is not the way others cook - and who knows what were the conditions in the kitchens of Delhi, Agra, Fatehpur Sikri, etc. 200 or 300 years ago. And there were a great variety of cooks or chefs making these recipes, not everyone handling and cooking things the same way. So, if something doesn't turn out exactly right - is it a fault of the recipe, or the instructions of how to make it, or the ingredients, or the utensils and the pots and pans, ovens, or the way I cooked it on a given day or night? So many possibilities. I say just keep cooking, experimenting, trying things different ways, etc, and get it better over time. And ask friends, or even the audience reading this here (that means YOU) for advise and suggestions - what am I doing wrong, or could do better, what ingredients or timing should be adjusted, changed? Hey, let me know. Right away, one should recognize that Mughal food is not your usual Indian food and curries - they are very spicy, but hardly ever are hot, hot, hot. And a question I have about ingredients included in the recipes - I'm not sure if some of the ingredients were available or readily available or commonly used in early Mughal times - things like tomatoes, potatoes, corriander, etc. which were exclusively south and central American plants, unknown to Europe, India, China, etc until the Americas were discovered and plants brought from the Americans and grown and used in the West, Asia, and Africa. Anyone know about this? I do not question Salma Husain's research and authenticity. He's done a superb job of research, finding and studying manuscripts of the time. An admirable and very interesting book. Okay, here are some comments from cooking these two Babur recipes. First it is hard to easily find lamb meat here in Charlottesville - almost no usual grocery store regularly carries lamb in their meat sections, but there is a wonderful butcher at West Street market, who ended up selling me a pound of minced lamb for around $5.39 a pound. A couple specialty stores ocassionally carry lamb (Foods of All Nations, but at over $6 a pound for minced) and Sam's club sell lamb boneless shoulders, but for usually $8 or so per pound. Other ingredients - green cardomon was new for me, but is very similar to dry cardomon pods, and I found some green cardomon at FOANs. Also we ended out having to rush to the store to buy powdered sugar for the bread, since we found we didn't have any on our shelves. Making the stuff cabbage rolls was new for me, but fun, and relatively easy following directions. My suggestions for all or next time - don't use the outside large leaves, rather use the softer leaves a little further in from the outside. 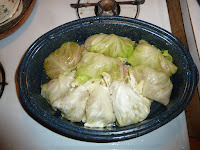 Our cabbage was hard and stiff, though still edible. 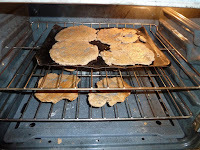 I'm not sure about what to do about the bread, since it turned out very strange, like a pie crust, as i mentioned above. First, the recipe calls for 1 cup of ghee to combine to two cups to whole wheat flour, which is strange to me, but I melted a couple cups of butter and combined it with the flour and other ingredients - the dough just didn't look or feel right, so I added a third cup of flour and then about 3/8ths of a cup of water to make it more dough bread like. Still it did not rise at all. And the 8 balls and rolled-out breads still did not look right, and then no tandoori oven, just a regular oven. Still a very interesting spicy bread pie crust - with the poppy seeds and the saffron brushed on top. I think I might try something different if I do it next time. Use about 1/4 cup ghee along with 3/4 cups water, instead of 1 cup ghee. That would make it closer to modern chapati or puri dough. Also, by the way, I noticed reading over the instructions for the bread recipe - it says add 1/2 cup ghee, not 1 cup. I had followed the 1 cup ghee ingredient as listed with ingredients. And then it says nothing about what to do with the second 1/2 cup ghee - again strange. Where's the mistake? If anyone else tries to make this bread recipe, and the results are wonderful, and / or if you adjusted ingredients in any way, please let me know. I'll then try this spicy bread again. Well, Barbur, did you enjoy these foods for supper during your time? For me it was a marvelous, interesting and wonderful experience at my first try of cooking Mughal cuisine.